Marvel’s smallest hero is back in action, but he isn't alone: he’s joined by a familiar partner in Ant-Man and the Wasp. Yup, Ant-Man 2 dropped the number to instead market itself as a double-bill, as Paul Rudd’s Ant-Man is joined by Evangeline Lilly’s Wasp, first teased at the end of the original film. After Ant-Man was unexpectedly missing from the recent crossover blowout Avengers: Infinity War, the new film is a welcome chance for more silly size-based action in the MCU. Ant-Man and the Wasp came out in cinemas in July and August 2018 (depending on which side of the Atlantic you're on), which means next on the agenda is the home entertainment release. The film is available in digital versions and on Blu-ray and DVD in the US, and after a lengthy we wait we can now also buy it on digital or disc here in the UK. We've seen the film, and you can read our review to find out what we thought - or find out what's in the post-credit scenes if you don't want to sit through the credits yourself. In the meantime, grab the original Ant-Man from Amazon if you want to remind yourself of how it went, or pick up Captain America: Civil War if you want to watch Ant-Man's most recent on-screen action. As we’ve already said, Paul Rudd is back as Scott Lang a.k.a. Ant-Man, joined by Evangeline Lilly’s Hope van Dyne - now stepping up to join the action as The Wasp. Unsurprisingly there are a few other cast members returning from the first film. 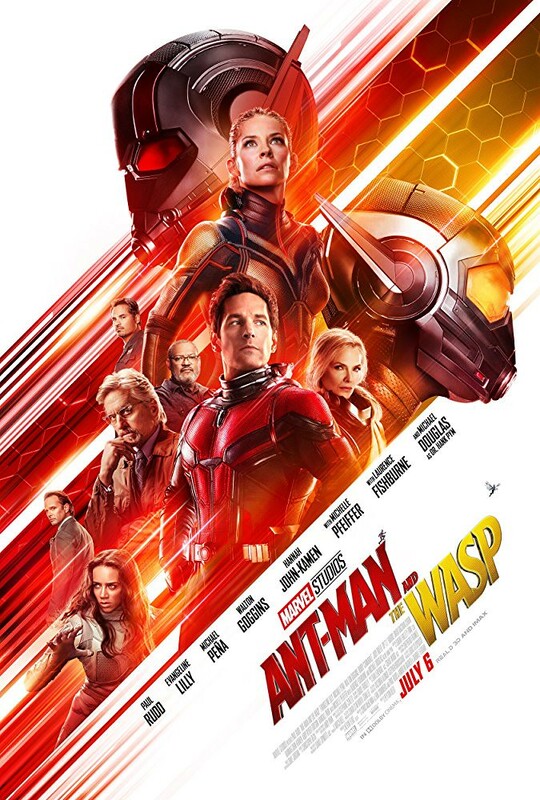 The most exciting is undoubtedly Michael Peña, whose quick-talking Luis stole every scene he was in last time around, but Judy Greer and Michael Douglas are also back as Scott’s ex-wife Maggie and Hope’s dad - and the original Ant-Man - Dr. Hank Pym respectively. We haven’t seen everyone before though. The biggest new casting is definitely Michelle Pfeiffer, making her MCU debut as Janet van Dyne - Hope’s mother, thought dead, but perhaps just missing in the mysterious Quantum Realm. She’s joined by Laurence Fishburne as another former hero, Goliath, along with Walton Goggins’ Sonny Burch, and Hannah John-Kamen as the rather mysterious looking Ghost. Behind the camera, Peyton Reed is once again directing after successfully taking over from Edgar Wright mid-way through production on the first movie. Luckily, production seems to have been a little smoother this time around. There’s more change on the screenplay front though - of the five writers credited this time, Paul Rudd (yup, the actor) is the only one who also contributed to the original Ant-Man. Despite that, fans might be reassured that among those writers are Chris McKenna and Erik Sommers, who wrote the also-pretty-great Spider-Man: Homecoming, and are working on that film’s sequel too. We've had eight posters for the film so far, with a couple of regular one-sheets (one of which is a smart repeat of the best poster from the first film) and six individual character posters. Those are arguably the most interesting - not least because one gives us our first detailed look at Michelle Pfeiffer in costume as Janet van Dyne. As the film's release date gets closer, Marvel has finally turned to releasing shorter TV spots for the film too, and here's one pf our favourites: the aptly named 'Fun' spot, which puts the film's sense of humour front and centre, in no small part thanks to the most footage we've had yet of Michael Peña's Luis. Right, let’s talk plot. It should go without saying that this will contain spoilers for Ant-Man, but we’ll also discuss other Marvel movies - including Infinity War - so stop reading now if you haven’t watched that movie yet. The biggest thing to know going into Ant-Man and the Wasp is that’s it’s set before Infinity War, so it doesn’t follow up directly on the climax of that film and, you know, the death of half of all living things in the universe. That doesn’t mean it doesn't tie in to Avengers 4 though - there’s been a lot of fan speculation that the Quantum Realm - briefly explored in Ant-Man and no doubt more prominent in the sequel - will somehow prove key to undoing Thanos’s slaughter in the fourth Avengers film, out next summer. The trailers already show a few glimpses of the Quantum Realm, and the team travel there to find Hope's mother, Janet van Dyne, and in the process find some tech that could prove crucial in Avengers 4 - or simply accidentally survive the attack from the safety of the parallel dimension. That might mean the film’s ending brings the timeline up to date with Infinity War, revealing what happens to the Ant-Man cast in the process. That’s enough about Infinity War though. What about Ant-Man and the Wasp itself? It looks like there are two villains at play: Walton Goggins’ Sonny Burch, and Hannah John-Kamen’s Ghost. The former is seen trying to steal Hank Pym’s shrunk-down office in the trailers, though we don’t know to what end. As for Ghost, she appears to be the main antagonist, with powers that let her phase through matter at will - perhaps also derived from the Quantum Realm - though we also don’t know her aims yet.